In true Scandinavian style, Mini Rodini, a Swedish brand, is designed to spark the imaginations of children. 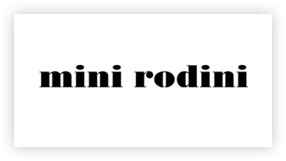 Mini Rodini's approach to sustainable fashion includes organic cotton clothing that is GOTS certified, and garments made from recycled materials. Their GRS certification for recycled material is the strictest certification available on the market today! Their signature prints include panda, unicorn, cat and stripes!